NEW! "McCann has kept his hands dirty for the 28 years I've know him, staying in the fight, and has served, as warriors do. This book contains his direct, unflinching opinions about close combat, and he ought to know." "If you are serious about self-defense, don't settle for theory. Buy this book and get the real deal." "Kelly McCann's combatives mentality is as honest and straightforward as it can get." 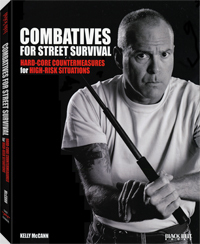 Filled with kicks, strikes, and skills that soldiers and civilians have successfully implemented, Combatives for Street Survival will teach you how to dominate would-be attackers in any violent and unexpected assault. Kelly McCann is one of America's foremost experts on personal and corporate security, armed and unarmed combat, and antiterrorist tactics. As the CEO of Crucible Security Specialists, he and his staff have provided security training for audiences ranging from elite U.S. counterterrorist units to Fortune 500 executives. He is also known to the public as "Jim Grover," former personal security editor for Guns and Ammo magazine and noted author of numerous instructional videos on armed and unarmed close combat and the best-selling book Street Smarts, Firearms, and Personal Security.